Durban – Fish Hoek’s renowned Mocké clan capped off a sublime family weekend’s effort in KwaZulu-Natal by winning three of the four SA S2 Surfski Championship titles up for grabs at Sunday’s second day of the inaugural FNB Mazars Durban Downwind surfski race. With the national singles title already in his possession after a memorable paddle on Saturday, Jasper Mocké teamed up with older brother Dawid and the Fenn Kayaks/Mocké Paddling Gear pair clinched their fourth national title together before Dawid’s wife, evergreen competitor Nikki Mocké, and Olympic bronze medalist Bridgitte Hartley won the women’s race. 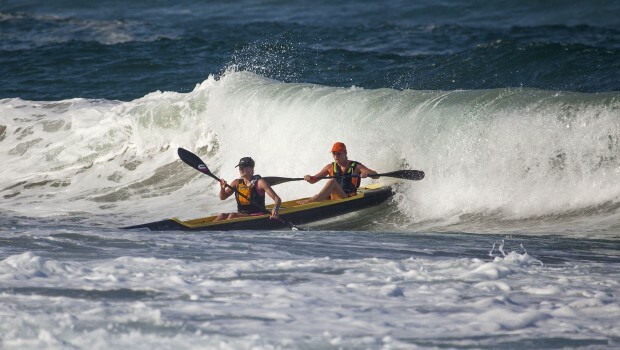 A switch in the course direction from Saturday’s action saw paddlers head south from Marine Surf Lifesaving Club to Amazimtoti and a solid start by the Mocké brothers put the rest of the field under pressure from the get go. “We had a flying start, which I was really chuffed with and everyone but Hank (McGregor) and Grant (van der Walt) fell back straight away,” explained Dawid. “Once Hank and Grant got in front we tried to came back at them but every time we got close they’d push hard again, something Hank is really good at, and so I knew if we were going to look to lead the race then we’d have to put in a catch-and-pass move. Trailing their regular rivals and the finish line getting ever closer, McGregor and van der Walt rolled the dice for the last time as they switched to a deeper line in search of some wind and runs. “When they saw they weren’t going to catch us on the same line as us, Hank and Grant went really deep and we couldn’t see them anymore. So we just looked to focus on our own race until we had to come in at Toti,” said Jasper. 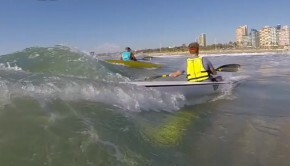 “It wasn’t as bad as yesterday at La Mercy but the surf was still pretty tricky. 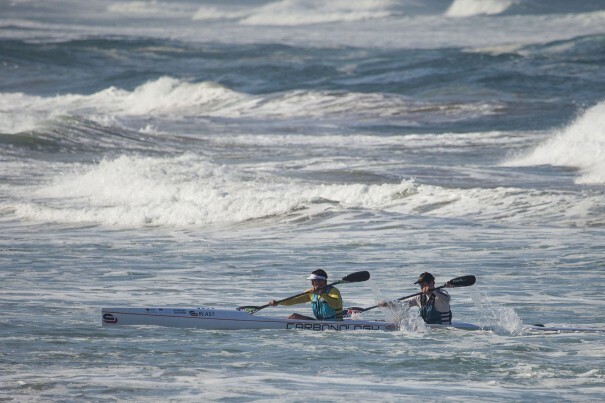 When we saw we had a bit of a gap though we just stayed calm and played it a bit safer by ducking in through the surf at a bit of a gully a little way before the finish and then paddling along the shoreline,” said Jasper. 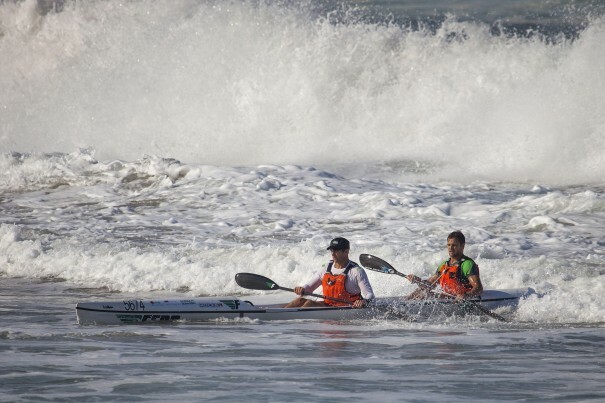 Having had victory ripped from his grasp just meters from finish line in Saturday’s singles race when he was thrown from his ski by a large wave, McGregor had to deal with his second disappointment of the weekend when the charging Rice brothers Sean and Kenny (both Think Kayaks) pipped he and van der Walt (both Epic Kayaks/Team Jeep) for second spot in the tightly contested doubles clash. Matthew Bouman (Epic Kayaks) and Jean Luc Mauvis finished fourth before Daryl and Brett Bartho became the third brothers pairing to finish inside the top five. The women’s race was one to remember for Nikki Mocké and Hartley, not only for their somewhat surprising victory given their unlikely pairing, but for the unconventional manner in which they achieved it too. Hartley, a sporting icon after her London 2012 feat, narrowly avoided an eleventh hour withdrawal due to a freakishly sustained injury however her arrival just minutes before the start of the race saw the pair miss the start by almost a full minute. “I eventually got to Marine, we frantically got ready and as we headed for the start line we heard the starter’s whistle go! “Let’s just say after our frantic first few kilometers the heart rate was already up nicely and there was no need for a warm up!” she laughed. 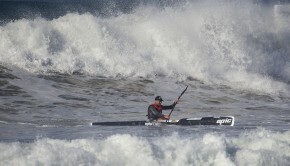 The different technique required and the unique challenge of ocean paddling had Hartley battling in the closing stages of the clash before she was confronted with her major obstacle of the day right at the finish line – the surf. 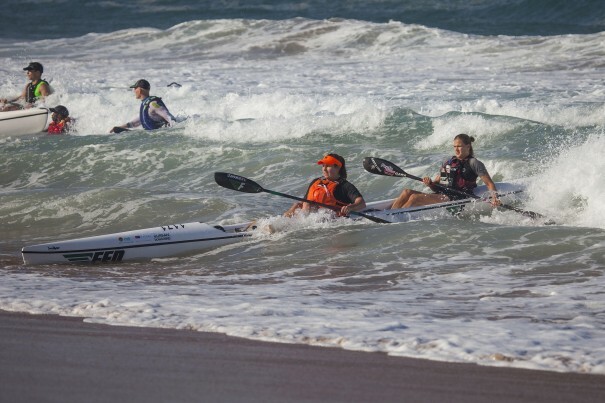 “I gave it my all but I’m not sure just how good a partner I actually was for Nikki because it’s such a different style of paddling and I just couldn’t keep the stroke rate up for such a long period of time!” said Hartley. “When Bridge was struggling we dropped off the pace a little and just looked to keep things going but this meant the others were able to close on us a bit and so we didn’t have all that much of a lead coming in to the surf at the finish, added Mocké. “I gave her a two minute run down of what to try do in the surf but she kept asking if we were meant to be where we were and if I was sure and I just kept saying ‘Trust me on Bridge, trust me’,” laughed Mocké afterwards. And trust Mocké she did as the pair come home cleanly to clinch the women’s title, Hartley’s second national title in recent weeks and neither have been in her preferred sprint discipline. “I won the SA Marathon Champs a couple of weeks ago and now this so it’s been a really cool couple of weeks trying some things that are a little different. “I can’t keep sprinting internationally for the next ten years so it’s nice to know that when I decide to call it a day on my sprints in a couple of years’ time, I can come home and keep paddling whether it be on the river, marathon or even surfski!” said Hartley. Apart from her own success, the day’s competition and tight racing also brought Mocké satisfaction. “Nikki (Russell) really paddled well yesterday and deserved to win the singles title and then she and Jenna (Ward) really impressed me again today! Ward and Russell (Fenn Kayaks) eventually claimed second place while Wilma Deyzel and Maya Opperman clinched third. 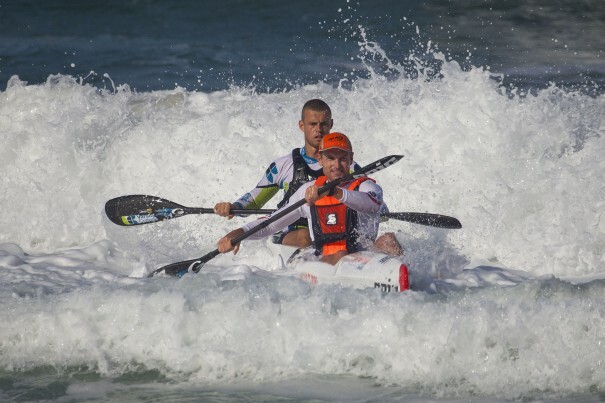 The day’s doubles action brought down the curtain on the inaugural edition of the FNB Mazars Durban Downwind and organisers and sponsors alike were well pleased with the weekend’s action. “FNB’s ongoing strategy is to support local and community events that show the potential to grow. We are firmly committed to supporting efforts to advance economic growth in KwaZulu-Natal. 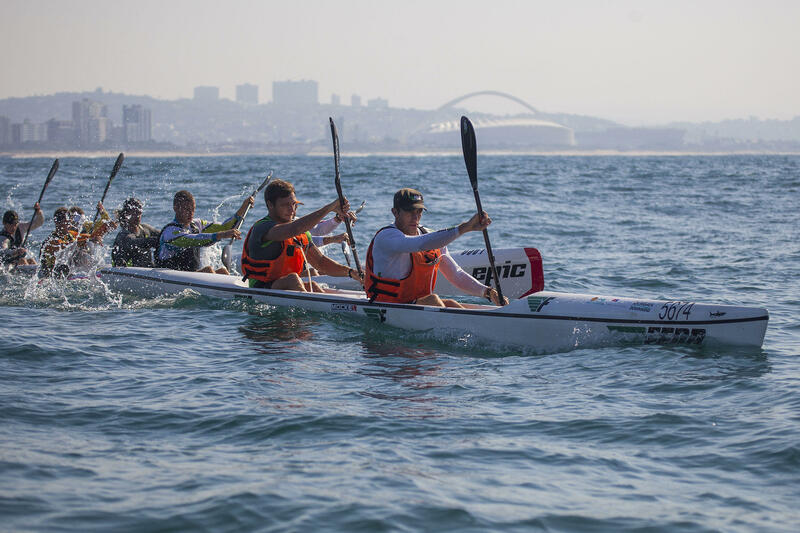 Our investment in the 2014 SA Surfski Champs is an extension of our commitment to this city and region. 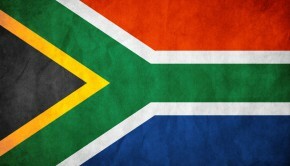 Congratulations to all the participants for making Durban a true sporting destination of global standard. Your commitment and dedication to this sport is truly remarkable,” said Preggie Pillay, FNB KZN Provincial Head. 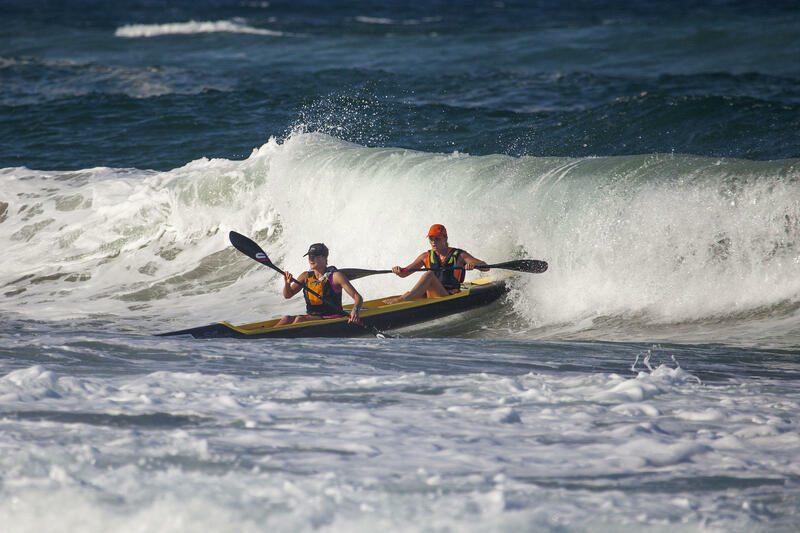 “Mazars’ sponsorship of the Durban Downwind & 2014 SA Surfski Championships is in-line with our commitment to invest in remarkable people who do amazing things. 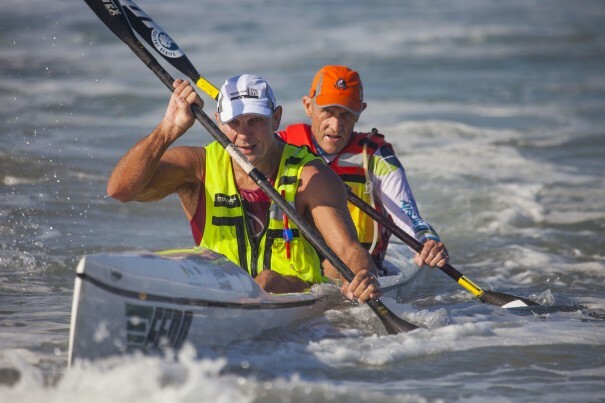 Like competitive surfski, Mazars is fast growing in stature in South Africa and the firm is proud to be associated with a sport which embodies our own values. We are committed to navigating towards success and are delighted to be able to help the competitors strive for and achieve the same,” said Mazars Durban Managing Director, Dave Bates.